March 18, 1928: “The Gumm Famly” (Judy, her sisters and mother, and father) performed at their Valley Theater in Lancaster, California. The reviewer of her show makes note of how popular she was with the audience. No surprise there! Judy Garland, one of the numerous group of Hollywood juveniles who bob up every now and then in angelic or antonymic roles, is doubling in brass at the Michigan by appearing on the screen in “Everybody Sing” and on the stage in person. She is successful in both roles, too, although she bobs higher in the flesh than she does in the film. That is because her studio did not treat her as well as she deserved in the matter of the story. At that, as an exponent of rampaging youth she gives a very good accounting in the picture, easily holding her own as a member of one of the nuttiest families to find its way to the screen in a long time. Judy proves an engaging bit of baggage, demure or dashing as the moment demands, in her stage appearance. She uses herself chiefly with singing, her voice having sweetness and volume, although the monolog she delivers is pleasing. The opening audience seems unwilling to let her depart, which is the true test of favor. In “Everybody Sing” Judy’s feet just won’t behave when there is music around, so when she transposes Mendelssohn into swing for the delectation of her young classmates in the brief absence of a teacher, she is packed home as impossible. Father is a choleric playwright with boundless ego. Mother is an actress who flits around aimlessly when not in the embrace of a young leading and of whom she is enamored, and who is not unmindful of the attractions of an older sister of Judy. The only persons with whom Judy can get a hearing are the chef, Ricky, who spends his off hours as a singer in a night club, and the maid, Olga, who years for her missing Boris. With the family beset by butcher, baker and everybody else who would trust them, Judy decides something must be done about finances. So she sneaks off a boat supposed to carry her on a select tour of Europe, blacks up and gets a chance to sing in the cafe where Nicky warbles when away from his culinary duties. She is a wow, and just like that, is given a leading part in a musical show that the cafe proprietor is induced to back. Micky, of course, is the leading maid, and even Olga struts her stuff when she stumbles backstage in search of Judy. That is the only part of the scrambled narrative, but it must suffice. Fanny Brice would have the onlookers in stitches if she had nothing more exciting to do than read a few pages from the Congressional Record. She is a very considerable item in “Everybody Sing,” as the maid who puzzles over parceling four squabs among twice as many guests, and with the familiar brand of comedy she dispenses in the show. Allan Jones gets a chance to sing and act in the improbable role of Ricky, and does a good job at both. Reginald Owen is the ranting playwright. Billie Burke is fluttery, and wasted, as his wife. Henry Armetta is the explosive cafe man, and Reginald Gardiner and Lynne Carver are other principals. Speed and skill characterize the stage show, which in addition to little Miss Garland offers the Five Janzieys, acrobats extraordinary the Four Franks, who mix instrumentalism, dancing and rough comedy beautifully, and Harris and Howell, sepia punsters who took the house by storm, as did the unprogrammed dancer with them. Edward Werner and the orchestra top all this off with “Light Cavalry” overture. 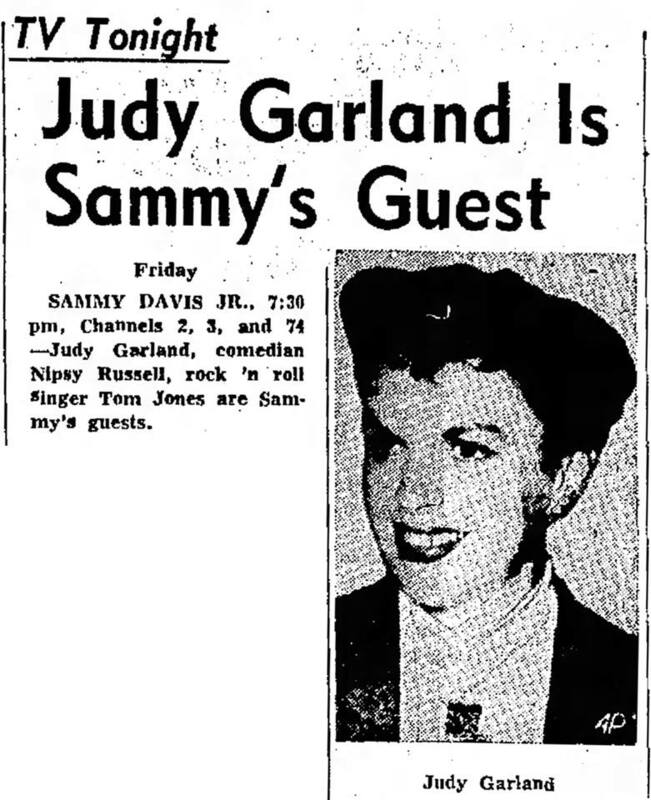 March 18, 1938: This article from the Ironwood Times out of Ironwood, Michigan, focused on the fact that Judy’s father, Frank Gumm, had played the local theater years prior. He must have made an impression for the paper to remember him and to point out his visit to the town while he was on the vaudeville circuit. Some of the claims in the article are amusing, especially the bit about how rifle and pistol practice is one of Judy’s hobbies! On this day, Judy arrived in Detroit, Michigan, as part of her “Everybody Sing” tour, having just concluded her appearance in Chicago. The article mentions meeting Judy as she passed through on her way to New York, but in fact, she was on her way to Detroit. Considering the other fabrications in the article, this little mistake is no surprise! 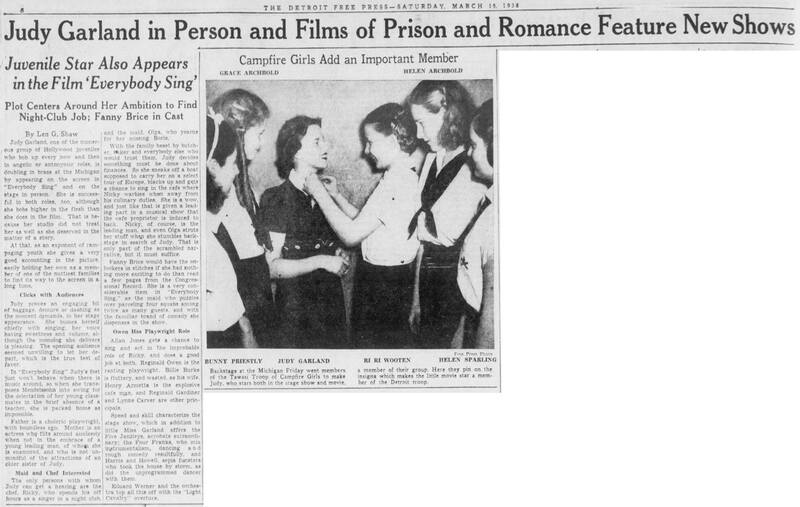 A recent article appearing in the Metropolitan press, written by Miss Dorothy Deere, deals with Miss Judy Garland, who recently sky-rocheted [sic] to fame in the movie world. 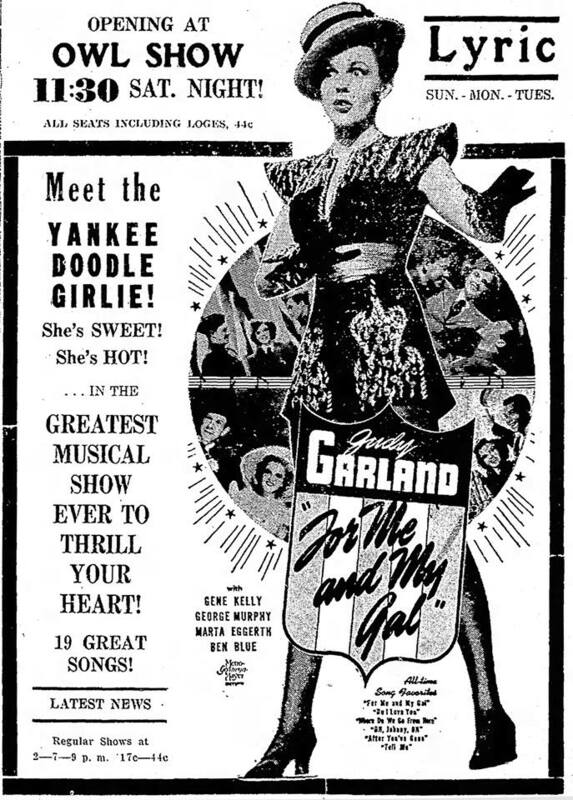 Miss Garland, whose most recent work, was seen at the Ironwood Theatre early in March, when her melodious voice and charming personality captivated Ironwood movie-goers in “Everybody Sing,” when she sang with Allan Jones, and frollicked [sic] with Fanny (Baby Snooks) Brice. 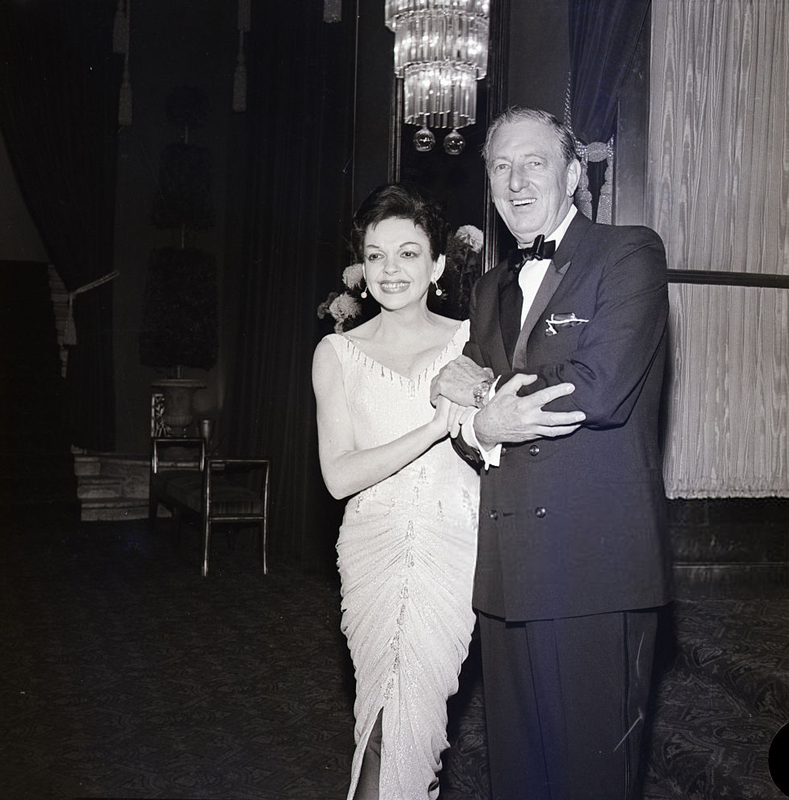 It may be interesting to Ironwood people to know that Judy Garland is the brilliant daughter of Frank Gumm who traveled the vaudeville circuits, and who was seen at the old Temple theatre here in Ironwood. That theatre occupied the space where the Golde Smart Shop is now, on Aurora Street. There is no positive proof that Judy’s first cry was keyed for the soundtrack or that her first “goo” was a request for greasepaint, but it is a matter of record that she started to sing at the age of 2, was doing a Helen Morgan on the Iano top at 3, and at 4 was a full-fledged entertainer. Her parents were vaudeville entertainers, her dad a singer whom. You probably remember as Frank Gumm. Her mother spent the first eight years of Judy’s life worrying over the dire predictions of other professionals that a child with such volume in her voice would “sing herself out” before she was 12. The little songstress is now “going on 14” and getting better with every note. The start of her screen career was a simple matter of walking into the MGM studios, stating that she wanted to be a movie star, and starting to sing in the hope that someone would listen. Every one within range listened and, luckily, one of them knew how to write his name at the bottom of a contract. Hollywood-ians can’t spell Gumm with two m’s, however, so her name became Garland. Recently we attended a screening of Judy’s fourth picture and first starring venture, “Everybody Sing” (not at the United Artists), and afterwards, still a-thrill with enjoyment, met the young swingster at the train as she passed through for a personal appearance in New York. Chicago, Miss Garland says, is her very favorite spot – and not because of any of the things the chamber of Sommers is wont to brag about. Judy spent the happiest week of her life playing at the Oriental Theatre with Georgie Jessel, and elephants and Judys don’t forget. There was only one thing she wanted to do between trains and that was to drive up and down Randolph st. [sic], circling ‘round and ‘round the theatrical district. The starlet was a symphony in green, her favorite color, squirrel, her favorite fur, and wrinkled-up nose, her favorite expression. She has no romance at present, her mother says her crushes changes from day to day, but her favorite actor is Spencer Tracy and her dearest ambition is to work with him in a picture. She has no sympathy for sissy sports, preferring horseback right and rifle and pistol practice — she indents to build a children’s hospital with her savings — and has already bought its site on a Hollywood hilltop! 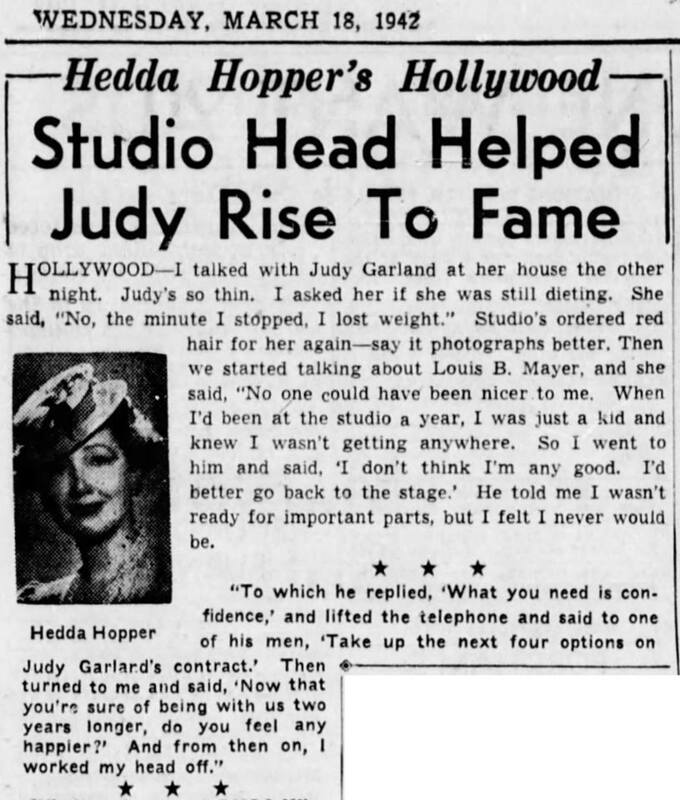 March 18, 1942: According to Hedda Hopper, “Uncle Louis” B. Mayer helped Judy out. Hopper makes note of how thin Judy had gotten. She wasn’t the only one who noticed that she was looking too thin. Other columnists commented on it as well as critics when reviewing, For Me And My Gal which was currently in production and in which her weight loss is very noticeable. On this day at MGM, Judy and Gene Kelly were rehearsing dance routines for For Me And My Gal. Time called: 10:00 a.m.; dismissed: 5:15 p.m.
March 18, 1943: Judy was out sick from the Girl Crazy production. It’s no wonder. She had just completed the revised finale sequence (the revised sequence was 10 minutes long) for Presenting Lily Mars, then went right back into Girl Crazy, which she had been filming before the revised Lily Mars finale. March 18, 1947: Judy had a rare ten days off from MGM and her current film in production, The Pirate. She went back to the production on March 28. Hedda Hopper’s column, published on this date, notes that Judy was drinking a lot of milk to gain weight and that MGM was allowing her to work only nine hours a day although she alleged was putting in eleven. This is all, of course, according to Hedda! 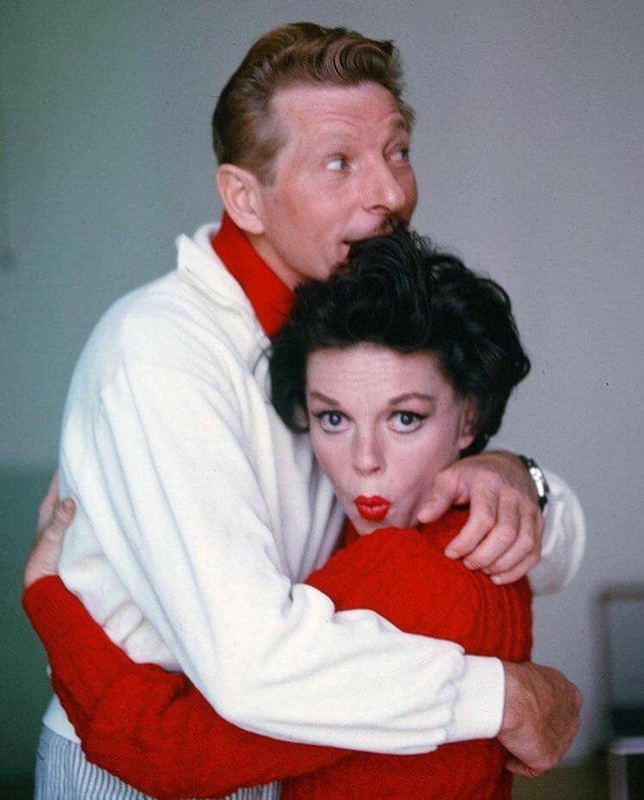 March 18, 1954: Judy and Danny Kaye were two of the biggest stars who hadn’t made the jump to TV. Judy debuted on TV in 1955 and Kaye became a fixture on TV in the 1960s, and they both debuted new series’ in 1963. Kaye’s series lasted for five years, but Judy’s lasted for only one season. Photo: Kay and Judy in 1963. March 18, 1954: Jane Wyman gave her Oscar predictions. 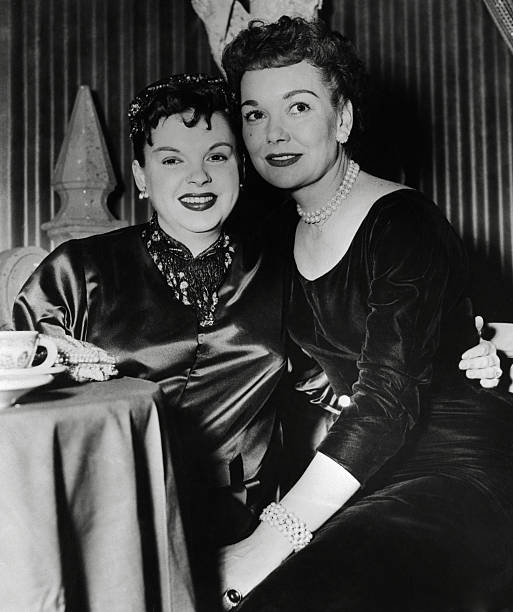 Photo: Judy and Jane at the announcement of the Oscar nominations, February 12, 1955. 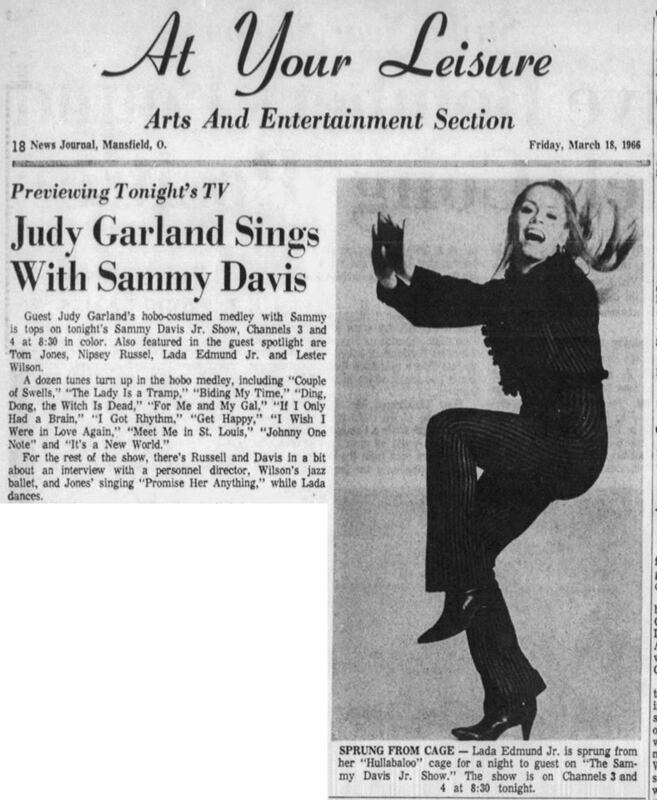 March 18, 1966: A few newspaper clippings promoting Judy’s guest appearance on “The Sammy Davis, Jr Show,” aired on this night on NBC-TV. The show was recorded on February 27, 1966. 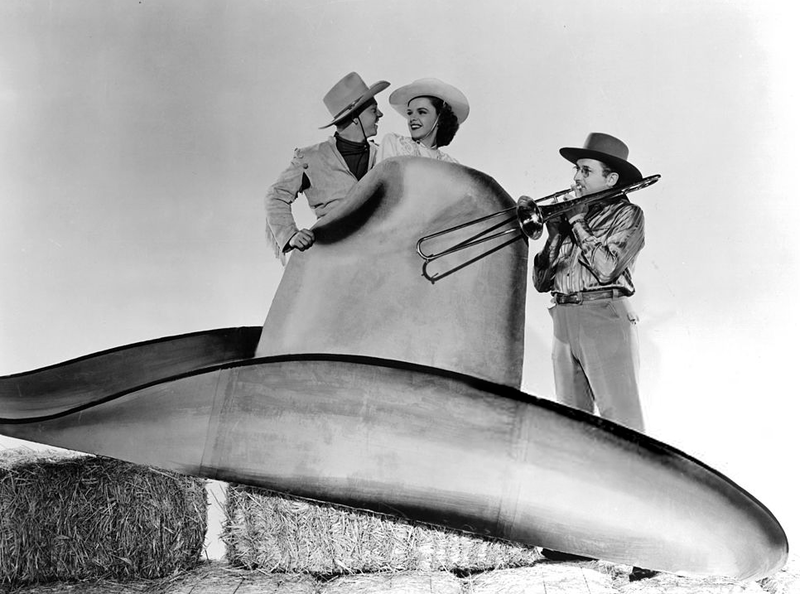 Judy sang “When You’re Smiling”; “The Man That Got Away”; “Give My Regards To Broadway” and a medley of some of her greatest hits sung with Davis and performed in Tramp costumes. At the end of the show, Davis asked her to return the next week, which she did. 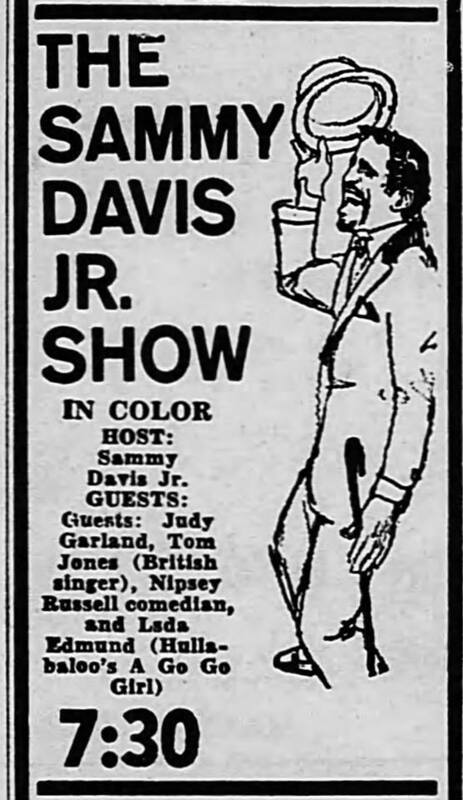 That show was taped on March 6, 1966, and telecast on March 25th. 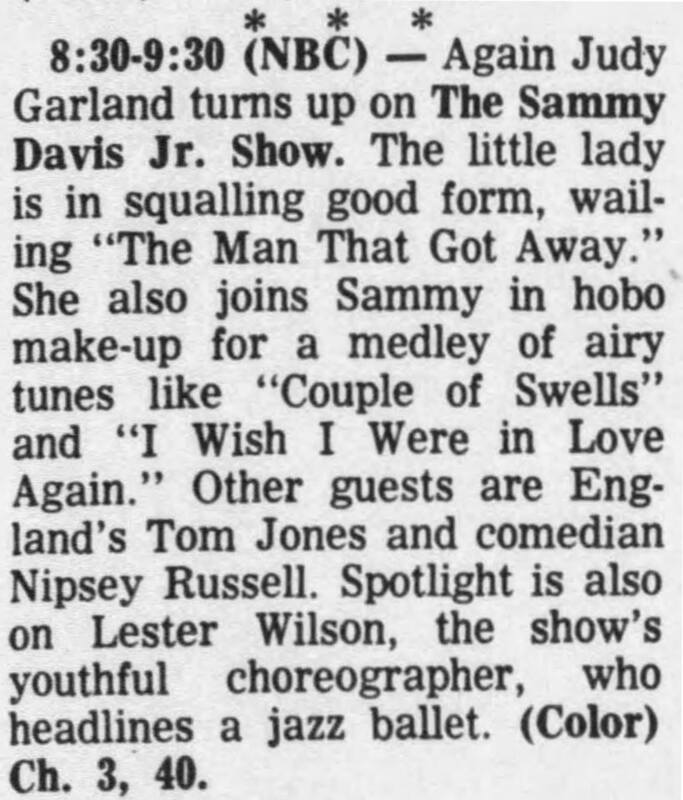 March 18, 1968: Judy’s recent reunion with Ray Bolger (March 11, 1968) was covered in Earl Wilson’s column. Also on this date, Judy slipped in her tub at the St. Moritz hotel, injuring her left should and collarbone. She was hospitalized and prescribed Demerol for the pain. Since there was no money to pay the hospital bill, her friend and companion tom Green took both the diamond jade ring she had bought in Hong Kong, and a diamond and cultured pearl ring she also owned and pawned them for $1,000 at the Provident Loan Society at Park Avenue and 25th Street. Judy was admitted to St. Claire’s Hosptial at 415 West 51st Street at 3:30 p.m. Her doctor was Bernard Mintz, and even with her AFTRA Insurance, a $100.00 deposit was requested, which Sid Luft brought in. March 18, 1969: Judy and new husband Mickey Deans arrived in Stockholm, Sweden, and stayed at the Apolonia Hotel. 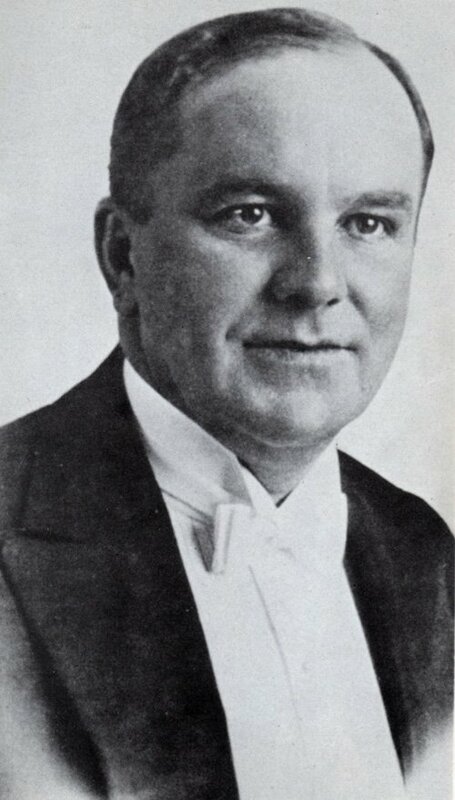 While on the tour, Judy’s dresser was Bridget Johansson, who had just divorced Ingemar Johansson, the former heavyweight champion of the world. Photos: Judy and Deans at the Stockholm airport provided by Kim Lundgreen. Thanks, Kim! 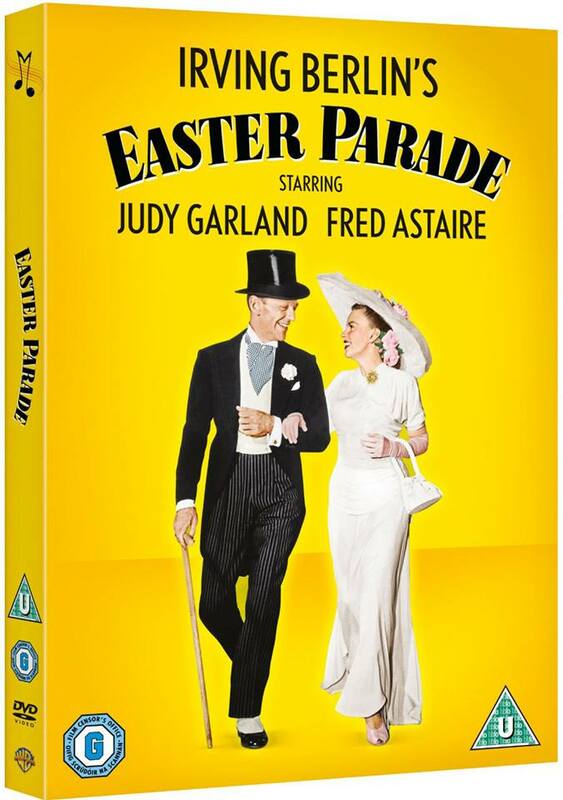 March 18, 2013: Easter Parade premiered in the UK on Blu-ray and new packaging of the DVD version. The release was the UK version of the Blu-ray that had just been released in the US on February 19, 2013. 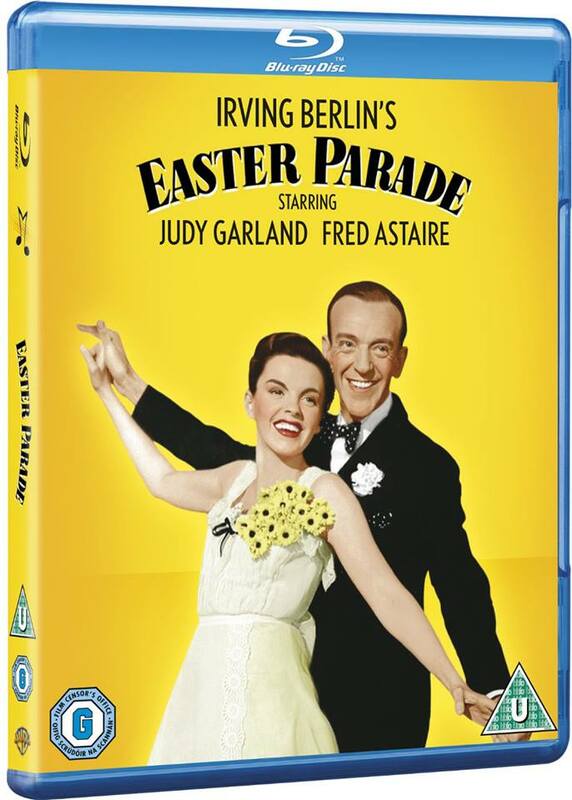 Excepting The Wizard of Oz, this 2013 release of Easter Parade is the last Garland film to be premiered in the Blu-ray format by Warner Home Video. Needless to say, we’re ready for more, but it appears that Warner Home Video has forsaken their catalog of Judy Garland films. Check out The Judy Room’s Easter Parade Blu-ray page here. March 18, 2015: The wonderful JSP 2-CD set, “Judy Garland Sings Harold Arlen,” was released in the U.S. The U.K. release was on March 11, 2015. Check out The Judy Garland Online Discography’s page devoted to the release here.